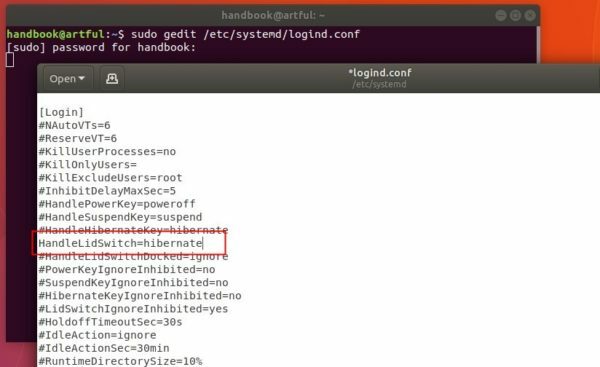 The hibernate functionality is disabled in Ubuntu by default because it might not work on some machines. 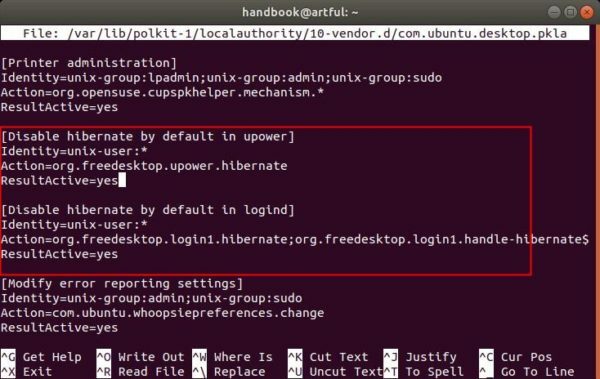 For those who want to re-enable the feature, here’s how to do it in Ubuntu 17.10. 1. Test if hibernate works on your machine. After you computer turns off, switch it back on. Did your open applications re-open? If hibernate doesn’t work, check if your swap partition is at least as large as your available RAM. Change the both values of ResultActive to yes. Save the changes by pressing Ctrl+X and then typing y and finally hitting Enter. After enabled the hibernate functionality, you can launch Settings from application tool. In the ‘Power’ settings, you are able to set ‘Hibernate’ when the power button is pressed. You can also make your laptop automatically hibernate when the lid is closed. When it opens, change the line #HandleLidSwitch=suspend into HandleLidSwitch=hibernate. Tip, you can replace the value of HandleLidSwitch to poweroff, ignore for other lid closed actions. To apply all the changes, restart your computer. The swap partition is larger than available RAM, but s2disk does not recognize it. The swap partition is recognized by swapon -s, though. Asweome. I was running s2disk and then recognized, that uswsusp was not installed. After installing it hibernation works pretty smooth. Just have to check how to enable login again, because right now the system restores the session without asking for credentials. PS: I use Ubuntu 18.04. It is helpful. Thanks. I’m also using Lubuntu 18.04 by the way. Like a charm. Only missing how to add hibernate option into the shutdown gnome button. Currently only options Cancel, Restart and Power Off are present. How to hibernate automatically when battery is over? Thank you. it worked for me more than 2 months. But from yesterday, it doesn’t work. I looked at the steps above and everything is set up properly. Could you help with this?